Loved by many — and mildly perplexing to perhaps the same number of players, — the patiently enduring flanger effect has been found on recordings since the mid-20th century, and at the feet of guitarists since the ’70s. Even though the effect can yield mild, nuanced results, the exaggerated “jet plane” sound is typically what comes to mind when flangers come up. While this in-your-face setting definitely has its time and place, the flanger is one of those effects that, in my opinion, is super versatile and can be used in a number of styles — toned-down, aggressive, or anywhere in between. So what exactly is flanging anyway? To put it simply, flangers belong in the same group as other time-based modulation effects like phasers and choruses. These effects essentially split the incoming signal into two identical signals. One signal goes through the effect unchanged, while the other signal has a few things done to it. For flangers, the wet signal is time delayed by just a few milliseconds, usually under 20. The time is then varied with a low frequency oscillator to sweep the delayed signal from its minimum to its maximum. Just like how you can change the delay time on an actual delay pedal and the pitch changes, micro pitch changes happen in a flanger as well, adding a detuned sound that can range from subtle to full-on sea sickness. When this wet signal gets mixed in with the original dry signal, the resulting effect sounds like comb filtering. This filters the signal at different points along the frequency spectrum, producing the flanger’s signature sound. This swept-comb filtering effect was first used in the 1950s, but one could argue that it wasn’t heard by mainstream audiences until The Beatles released Revolver in 1966. Legend has it that while in the studio, John Lennon wanted to streamline the tedious process of double-tracking his vocals. Abbey Road engineer Ken Townsend came to Lennon’s rescue, with a trick involving two tape machines. The tapes would have the same material on each machine, and then the engineer would push the playout reel’s rim, also known as a flange. This slows down down one of the signals, slightly creating the swoosh. Going back and forth between the two decks would then create the oscillating effect. When these two signals finally combined back together onto a third tape machine, the effect was in its full form. Lennon eventually called this “flanging,” and the rest is history. Flanging exclusively found its home inside recording studios until the 1970s. The race toward smaller and more powerful technology made the advent of effects pedals possible. Using analog bucket-brigade delay chips, manufacturers were able to develop ways to fit the flanging effect into boxes that could fit in the palm of your hand by the end of the decade. By the ’80s, flanger pedals by Boss, MXR, and Electro-Harmonix were at the feet of big-time players like Eddie Van Halen, Andy Summers, and Johnny Marr. With the massive growth of the pedal industry in the last few decades, along with the continuing miniaturization of technology, modern flangers can squeeze in a variety of different features for you to create some really weird sounds. Most flangers have at least two controls, Depth (or Width) and Rate (or Speed). Depth controls the delay time, ultimately affecting how “detuned” the wet signal sounds. Turning this up can lead to extremely out-of-tune sounds, and potentially induce sea sickness. The Rate controls how fast the oscillator sweeps back and forth. Set it low for a slow and deliberate sweep, or turn it up for old-school ray gun blasts. 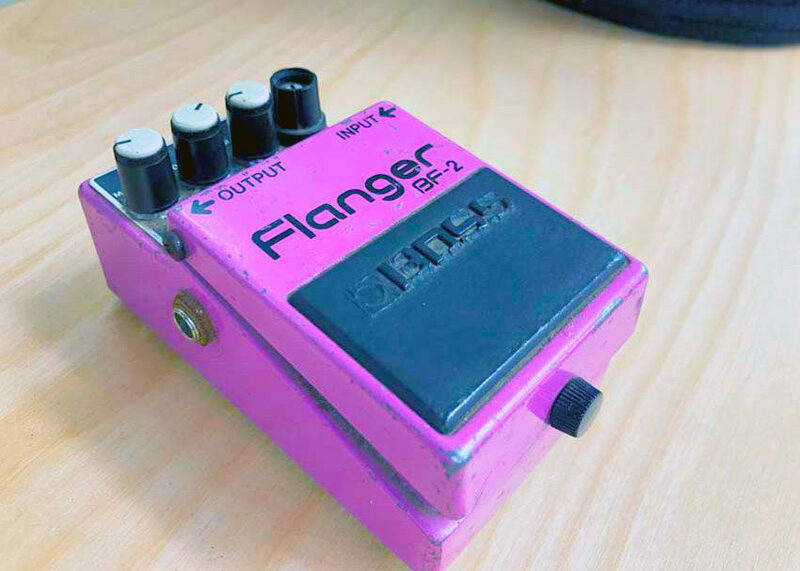 Flanger pedals from different manufacturers typically have other controls as well. On the Boss BF-2 I’m using for the audio demos, Manual and Resonance controls are also available for use. According to Boss, the Manual controls the sound of the delay (and the timbre of the flanger overall). Resonance (also called Feedback on other flangers) takes the wet output of the effect, and loops it back to the input. This affects the intensity of the effect. One unique flanger control that comes to mind is the Filter Matrix mode found on the Electro-Harmonix Electric Mistress and PolyChorus pedals. When engaged, the flanger’s oscillator turns off, allowing you to manually “tune” the oscillator to one single point within its sweep. Try using this technique in the studio or live to find a point where your tone cuts through the mix for razor sharp leads, or to just create some general sonic chaos. As I previously mentioned, the flanger used for these samples is my trusty Boss BF-2 I bought used sometime around 2002. (The BF-2 has been discontinued for nearly 20 years, but you can currently pick up the pedal’s successor, the BF-3.) The pedal also marked my first foray into the use of modulation effects — I was really trying to cop the flanger tone heard all over Thursday’s Full Collapse. Since other flangers don’t have a Manual or Resonance control, I’ve kept to only adjusting the Depth and Rate controls for these samples. I plugged a Gibson Les Paul into an Electro-Harmonix Op-Amp Big Muff (for the fuzzy samples), through the BF-2, and into a Universal Audio Arrow interface. Finally, I set up a cleanish Marshall JMP model with the Unison preamp. The first sample here is the archetypical flanger sound: the slow jet-plane whoosh. With the Depth set high, the flanger is able to sweep almost entirely throughout its range. I also set the Rate low so you can hear every nuance of the effect. Check out Rage Against the Machine’s “Killing in the Name” to hear Tom Morello’s take on this classic effect. For sample number two I played a simple progression with some chunky chords in a bouncy rhythm. I set the Depth and Rate to noon, and you can hear how the flanger adds some movement and interest into the playing. I feel like this is a typical setting for the early-’80s new wavers and post-punks. The third and fourth examples showcase how the flanger sounds with single note leads. The settings are unchanged from example 2. Since there’s less harmonic content on single notes, as opposed to chords, the “whoosh” factor significantly reduces. Adding the Op-Amp Big Muff to the part adds a really cool gnarliness, in my opinion. This is the type of thing you can hear all over the Smashing Pumpkins’ Siamese Dream. For the final example, I kept the Depth control at noon, and cranked the Rate to create a Leslie-esque, rotating speaker effect. I have always loved the Leslie guitar sound since I’ve heard “Black Hole Sun” by Soundgarden, and I feel like this is pretty close for the money. More experimentation with the Depth control can yield some pretty wild sounds, but for the faster Rate stuff, I like to keep the Depth on the tighter side.